It's strangely inevitable. People attending the Oregon Brewer’s Festival will want to do a little tasting on the side. It’s tough to fathom, given the 86 beers available at the Festival, but it’s going to happen. 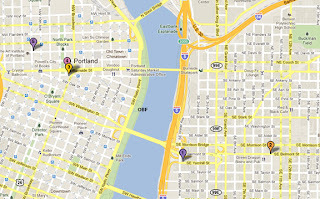 So I’m making a few suggestions…places within walking distance of Waterfront Park that represent some of the best beer selections Portland has to offer. No need to explain the walking part, right? Five walkabout destinations by the numbers. 1. Hair of the Dog After operating his brewery out of a Southeast Portland warehouse for many years, brewer Alan Sprints finally stepped to the plate and opened a first rate tasting room closer to the city on Yamhill and Water Ave. Hair of the Dog should be at the top of any serious beer fan’s list when visiting Portland. It’s where you can sample some of the finest beers on the planet. Adam, Fred, Ruth and the excellent barley wine, Doggie Claws, are all available to taste in exquisite glassware. These are high alcohol beers, so don’t overdue it. Hair of the Dog beers are available for sale in bottle-conditioned form at the pub and in select stores around town. These beers, like fine wine, are generally thought to improve with age. But they also taste great directly out of the tap. 2. Cascade Brewing Barrel House One of the founding fathers of the craft beer movement and the Oregon Brewers Festival, Art Larrance, opened the Barrel House in 2010. Larrance also operates the Raccoon Lodge in Raleigh Hills, but the Barrel House is truly unique thanks to the beers being produced there. Brewmaster Ron Gansberg, who came from the wine making industry, is dedicated to being different. He and Larrance wanted to offer an alternative to what they refer to as the “hops arms race” in the Northwest. They landed on the idea of creating a line of sour beers similar, but not quite identical to, Belgian-style ales. They use fruit grown in the Northwest and oak barrels from local wineries for aging. This effort started in 2005 and their sour beers have been recognized several times at the Great American Beer Festival. They offer more than their sour beers at the Cascade Barrel House. But sample the sour beers if you go there. They are pretty unique. 3. Bailey’s Taproom The growing popularity of craft beer has resulted in growing number of pubs that feature a huge number of guest taps and wide selection of beer. Bailey’s Taproom is one of the best. It offers 20 constantly rotating taps that emphasize Oregon and Northwest beers. Bailey’s hours are limited to late afternoons and evenings and they don’t have food. But the beer list is primo and the assistance provided by the servers is excellent. Also, Bailey’s is one of the few places that regularly updates the list of available beers on their website. Their stated goal is to constantly offer one of the most eclectic selections of beer around and provide an atmosphere that is comfortable, accommodating, and encourages enthusiasm for the unfamiliar. They succeed on all counts. 4. Tugboat Brewing Across the street from Bailey’s Taproom you’ll see the Tugboat Brewing fascia. Tugboat started operations in 1992. It’s a logical destination for OBF visitors because it represents the small ball approach that once characterized brewpubs in Portland. The brewhouse is small, producing the equivalent of eight kegs per brewing session. Owner/brewer Terry Nelson apparently brews what he feels like as his schedule permits. For 20 years, Nelson has maintained the values of small scale beer production and friendly, down to earth ambiance. While some of Oregon’s craft breweries have gone to mass production and distribution, Nelson likes to think Tugboat has taken a calculated step backwards by staying small, family-owned, and respectful of the beer and his customers. You never know what you’ll find on tap here. Don’t worry about it. Have a pint of house beer and take in the ambiance. It’s worth the trip! 5. Deschutes Brewing Based in Bend, Deschutes Brewing has enjoyed amazing success since opening in 1988. It is now the fifth largest craft brewery in the United States. Deschutes didn’t open a brewpub in Portland until 2008, possibly because they wanted to find the perfect space. They found it, then spent a fortune renovating the building to their specs. What they have is striking, with high ceilings, a sizeable bar area and plenty of table seating. The brewhouse is a custom-built 20 bbl system which is prominently on display for beer fans to absorb. 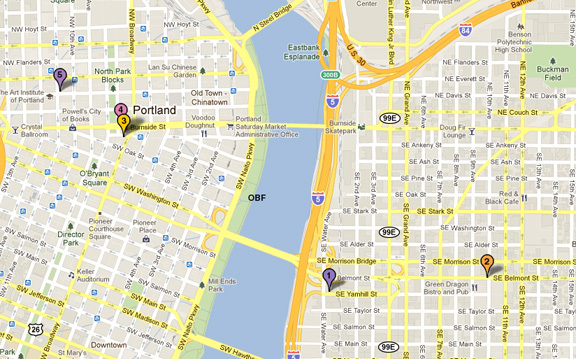 Most of the beers served at the Portland brewpub are produced there. That list includes a number of specialty beers you won’t find in stores or pubs. Whether you like their mainstream beers or not, you have to face the fact that Deschutes produces a consistently excellent product. Mirror Pond Ale has won a number of awards and Black Butte Porter is the best selling craft brew porter in the land. There’s nothing at all wrong with their standard beers, but look to the list of specialty beers like Imperial Hop in the Dark, Streaking the Quad, Chainsaw White IPA or Fresh Squeezed IPA for a taste treat. Great stuff.